This is the process where collected knowledge of a culture is passed on to children, typically. A type of education that is based on the skills of adulthood. Typically done in the home. 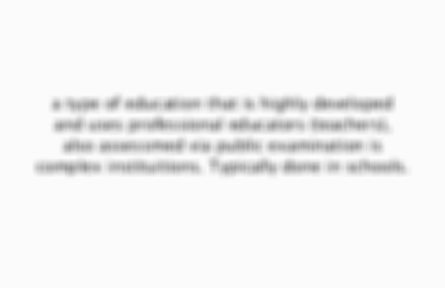 a type of education that is highly developed and uses professional educators (teachers), also assessmed via public examination is complex instituitions. Typically done in schools. What are the 4 Functions of the education system? 1. 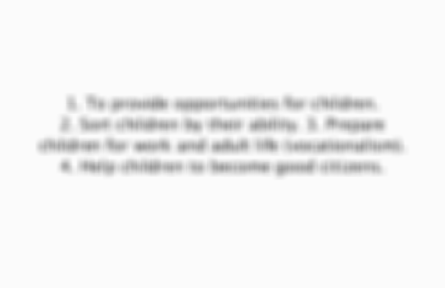 To provide opportunities for children. 2. Sort children by their ability. 3. Prepare children for work and adult life (vocationalism). 4. Help children to become good citizens. What did Emilie Durkheim claim? 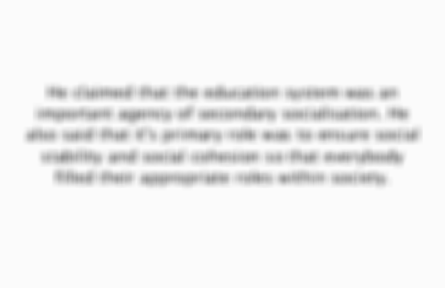 He claimed that the education system was an important agency of secondary socialisation. He also said that it's primary role was to ensure social stability and social cohesion so that everybody filled their appropriate roles within society. Children are taught the skills needed for employment. What do Marxists say about socialisation and education? Marxists see education and socialisation as a way of brainwashing children into accepting inequality. What is the fuctionalist view on socialisation and education? Functionalists belive that education and socialsation has bridged the gap between the the close personal relationships at home and the less emotional relationships at school. Children will begin to have shared cultures, and learnt their place. Which theorists said that teachers and children work together to construct knowledge? Which theorists said that children are balled by teachers in schools and learn to act according to those labels? Which theorists said that the education system is a ladder of opportunity for the best people to get to the top? Which theorists said that the education system exists to ensure that children learn to accept inequality as normal and acceptable? Which theorists said that the education system exists to ensure that male power and dominance over women is maintained? if a system is based on fair competition, where talent and effort decides who succeds. (Based on merit).